We all love our stamps inks and papers. How many of us set aside dedicated time to play with them? I bet quite a few of you are slow to raise your hand. I am here to help you with that. 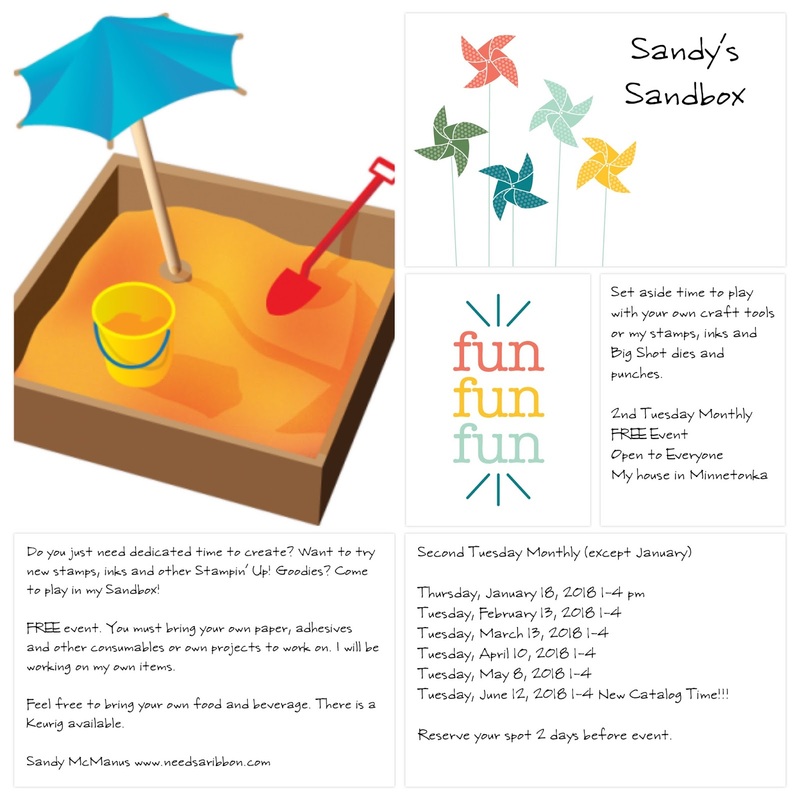 Starting in a few weeks I am hosting what I call Sandy's Sandbox. Much like the sandboxes of our youth where we would gather and play and share toys and have fun and visit, we will do that in my studio. I am opening up to you my stamps, inks and Big Shot items for you to try them and play with them, and then see if you want to buy them. This will not include any consumables like paper or adhesive or embellishments. Event is FREE to you. You are welcome to bring a friend. Event will be held second Tuesday of every month for 6 months, with the exception of January. I ask that you RSVP 2 days prior whether you plan on attending. See flyer below. Be sure to mark your calendar! Feel free to save the picture below to your phone for future reference. Sandy's Sandbox Flyer Print for your reference. It can also be found under the Toolbox tab.